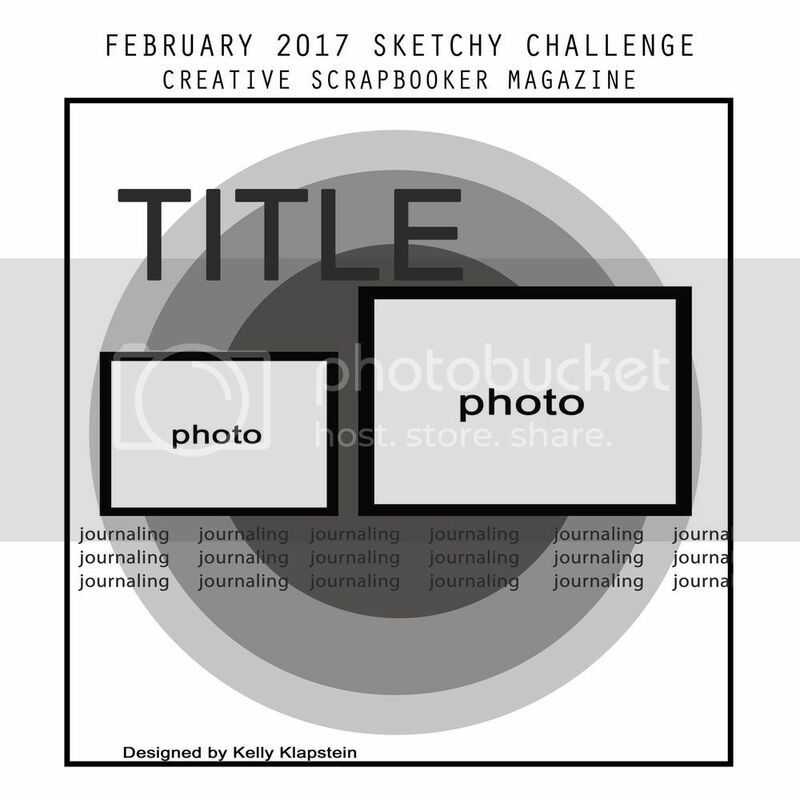 Scrap Shotz February 2017 Kit-#I Heart Project Reveal! 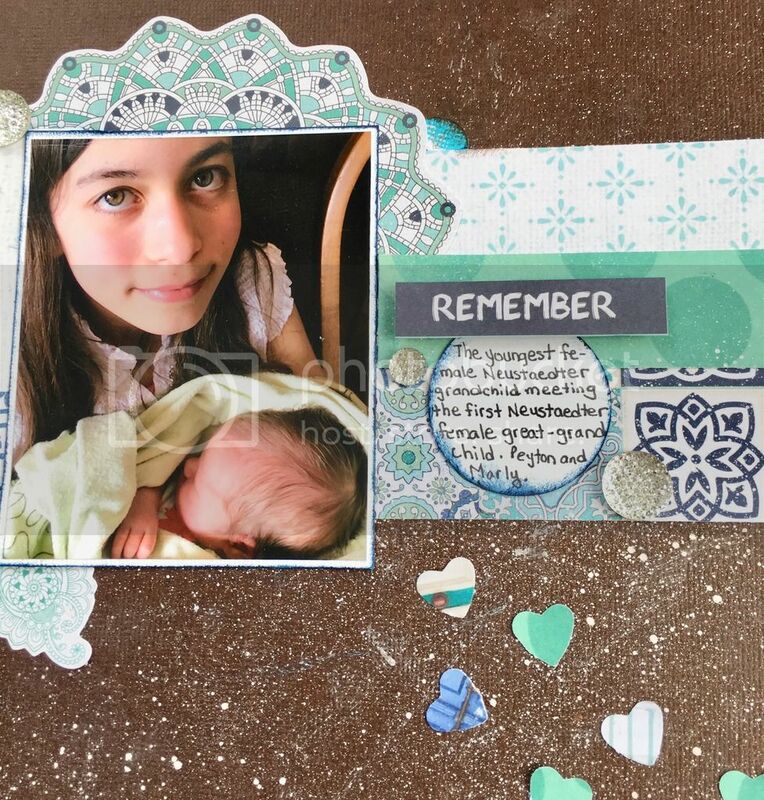 Let's kick off this edition of the kit project reveal with CT member Lorraine. 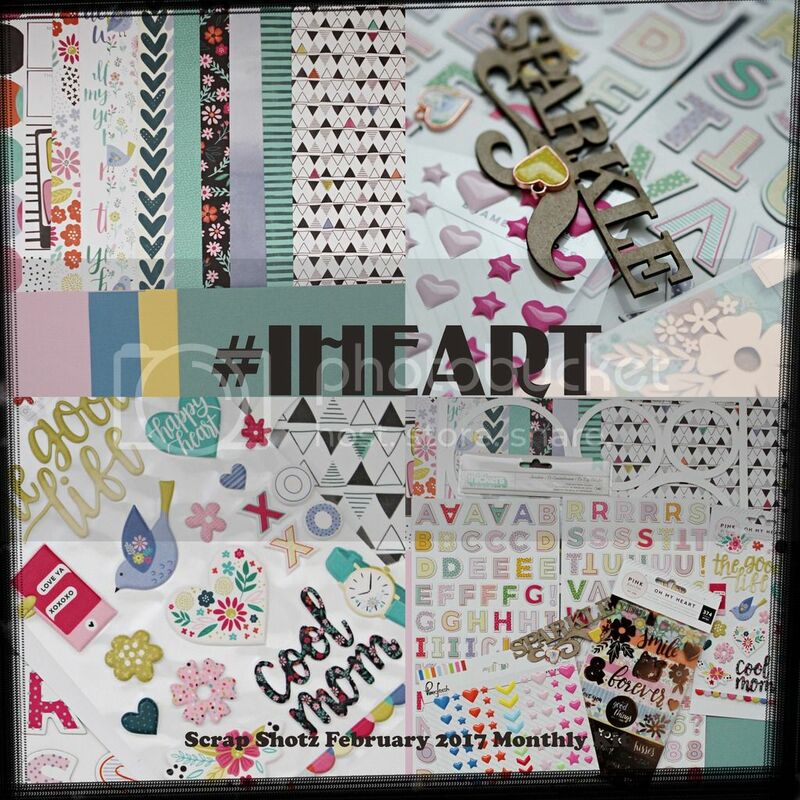 Here's a look at this month's kit which features the Oh My Heart line by Paige Evans for Pink Paislee. Click HERE if you would like to purchase the kit as part of a new monthly subscription. 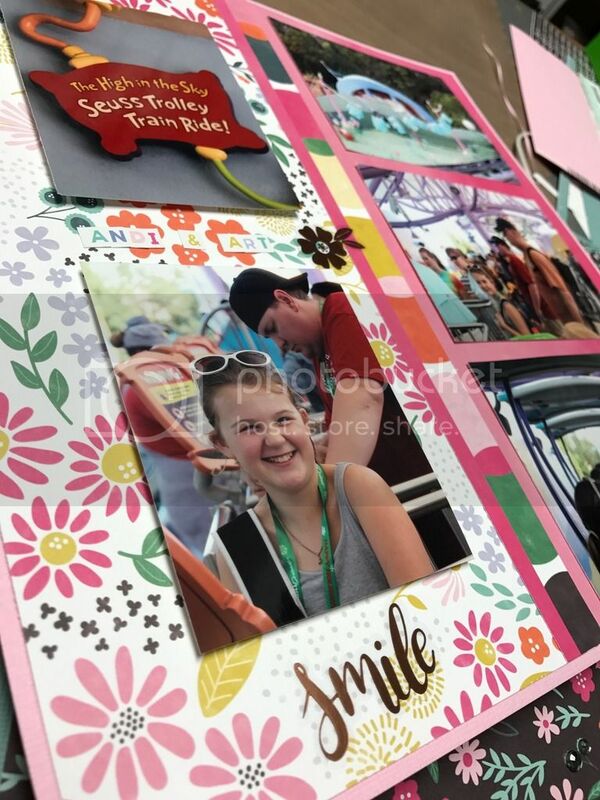 Lorraine got 10 photos on this layout by using the die cut openings as frames for her photos. This is a great way to remember the details of this attraction. Lorraine fussy cut the sign from this photo and layered it over the frame's edge showcasing the unique sign. Is this not the perfect title for this photo? 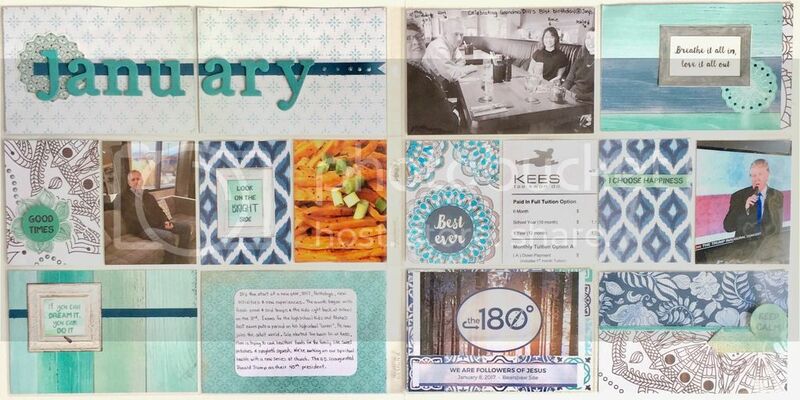 The kit also includes a lovely die cut chipboard piece from Southern Ridge Trading Company. 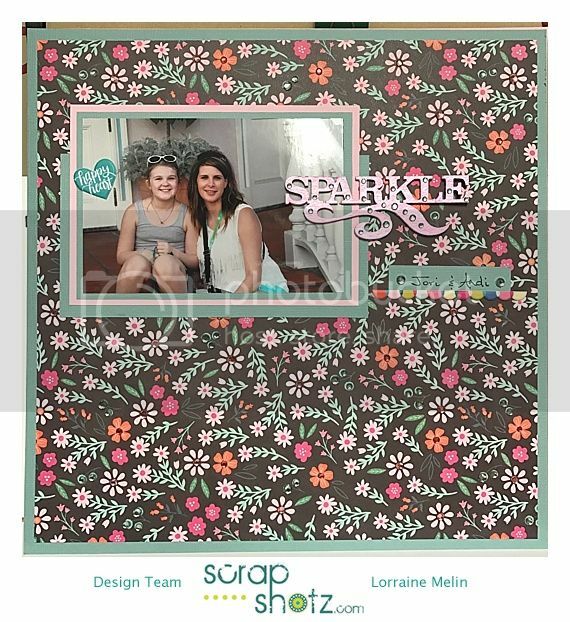 Lorraine made this "sparkle" with lots of shine. 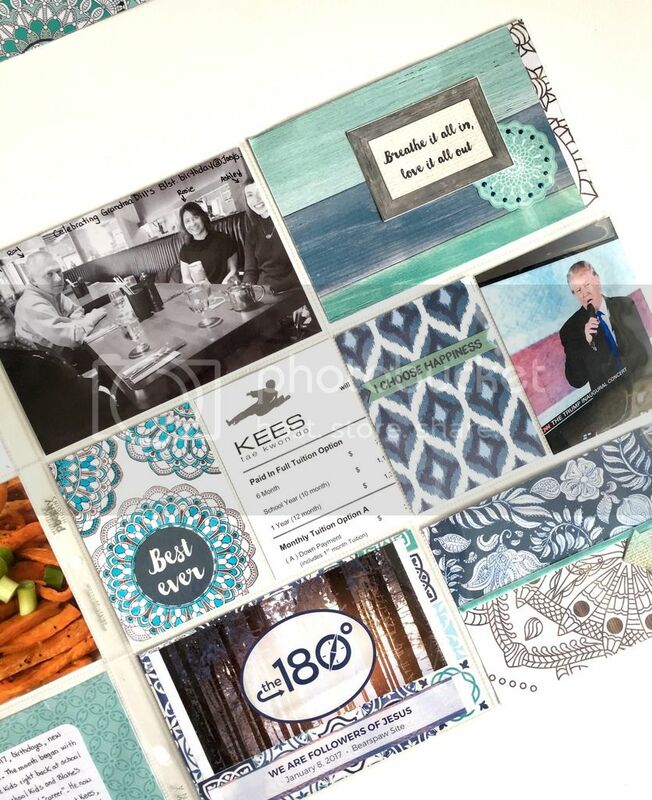 This eye pleasing mix of patterns shows off how easily these papers coordinate with each other. The stickers are a pretty rose gold-ish color, just the right shade to stand out on the patterned paper. Painting the wood die cuts to coordinate with the paper and alphas ties everything in together on this happy vacation layout. Thank you Lorraine for your lovely projects and thanks to everyone for stopping in to take a look! 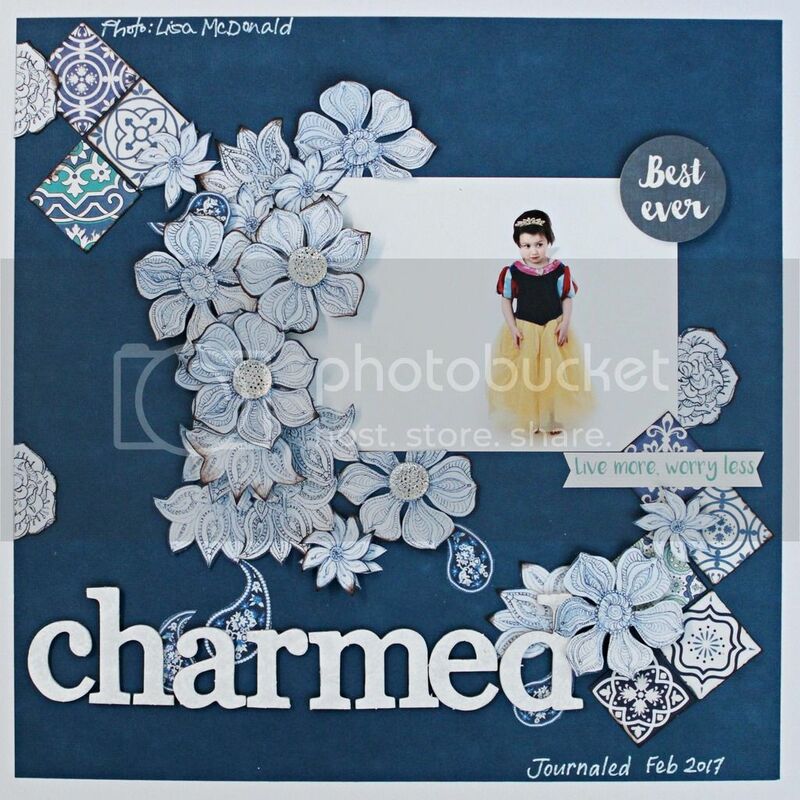 Welcome back to the blog for some additional inspiration from the Scrap Shotz December 2016 Monthly Kit. We have some lovely projects courtesy of Creative Team member Virginia. 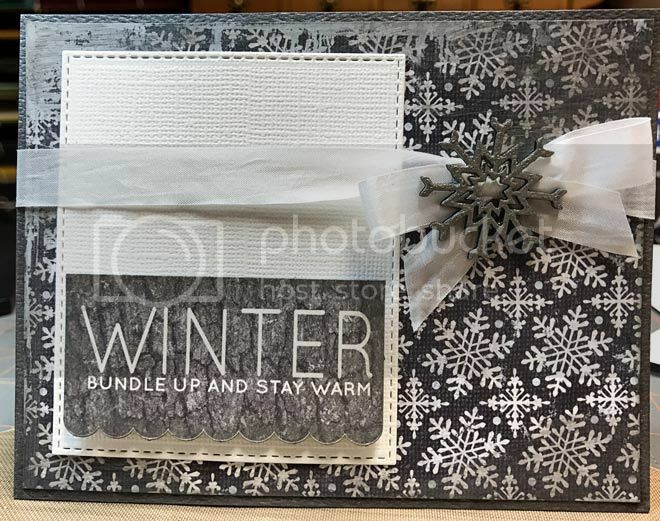 I used the title of this layout as the post title, the wintery themed products are perfect accents for these gorgeous winter photos. The wooden snowflakes are so pretty covered in glitter and Virginia has done a great job mixing patterned papers. 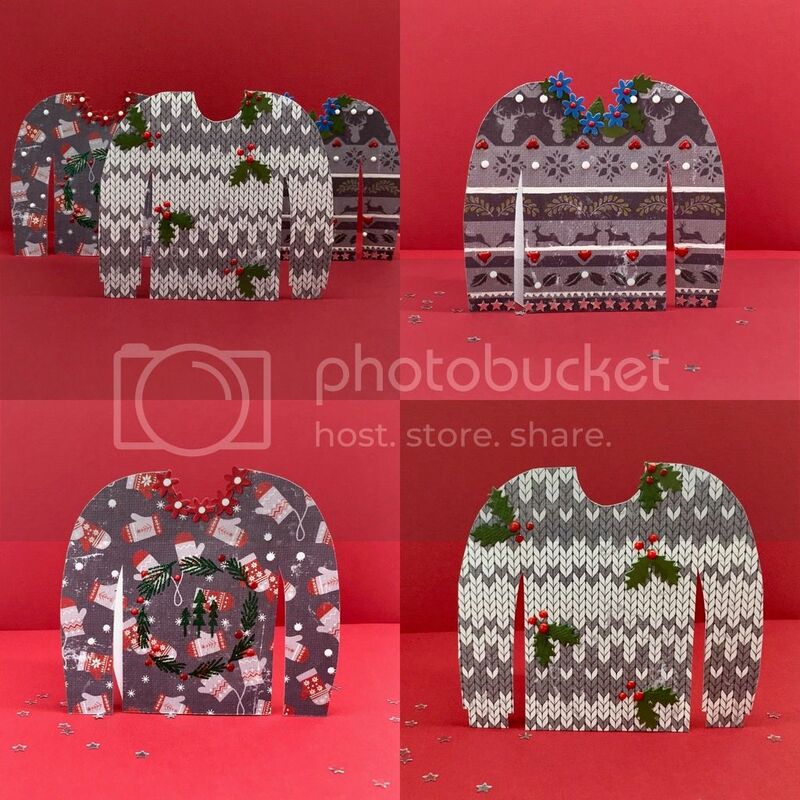 These ugly sweater cards are darling! What a creative way to use these papers😊. Thanks for stopping in and taking a look. If you have any questions about these projects please leave a comment. We have some lovely cards to share with you created by our Creative Team member Lorraine. Who wouldn't be cheered receiving one of these beautiful cards. 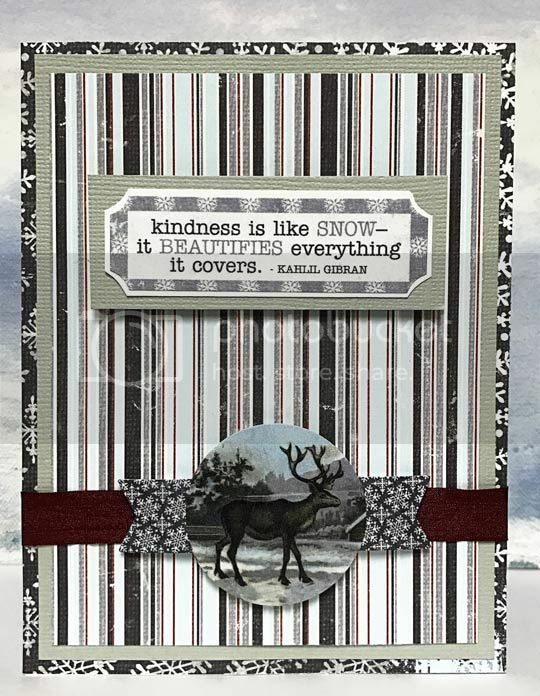 The Scrap Shotz December kit provides all the supplies needed to create these cards with the exception of the ribbon which came from Lorraine's stash. 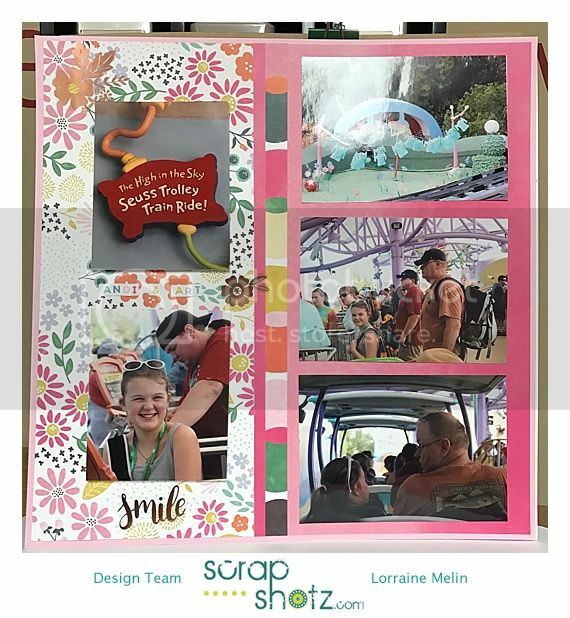 The kit is sold out but if you are interested in Scrap Shotz kits, click here to see the latest kit available for purchase. 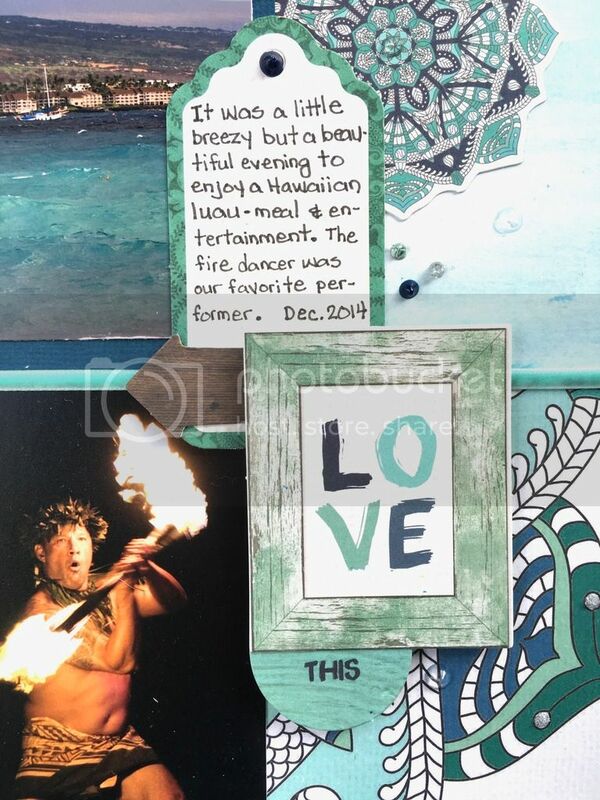 This is a lovely any occasion card, that centre panel is a sticker from the 12x12 sticker sheet included in the kit. 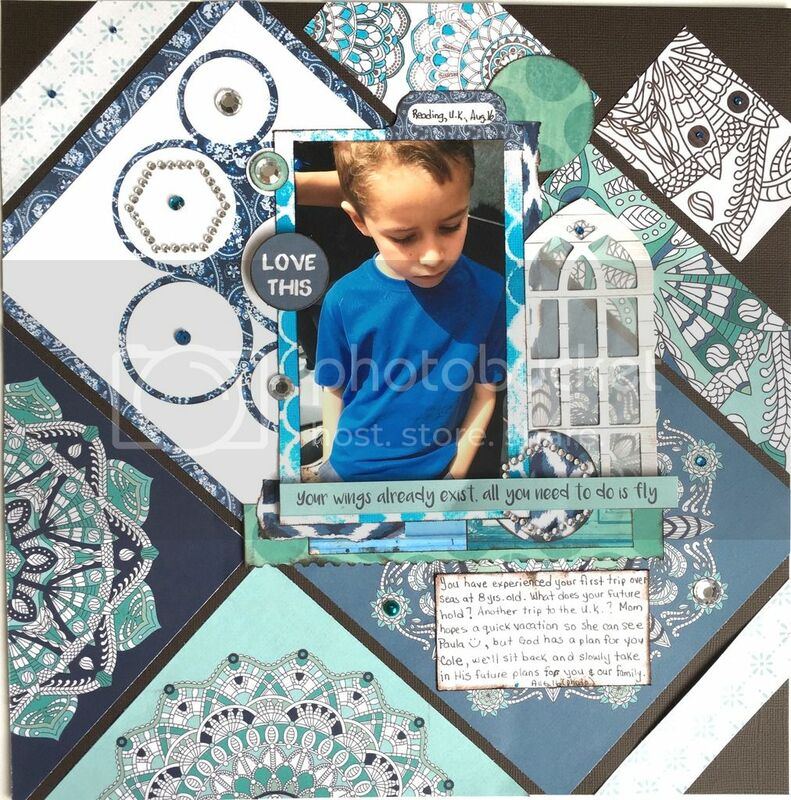 The black card stock creates a striking frame for the patterned paper panel. 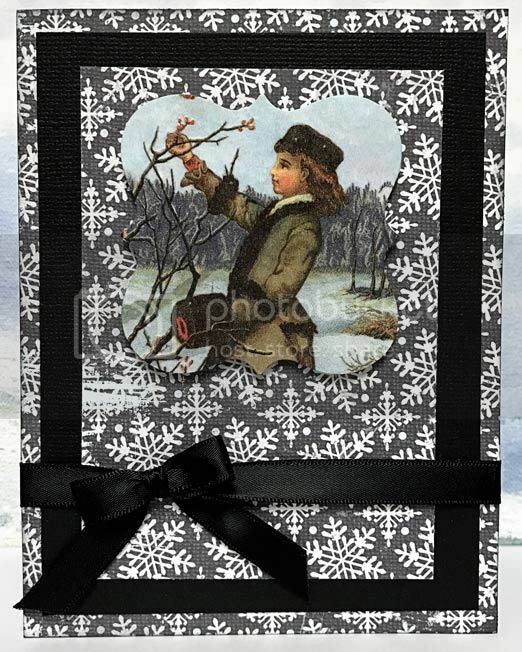 Lorraine's bows are a signature touch on her cards and this white bow is gorgeous. 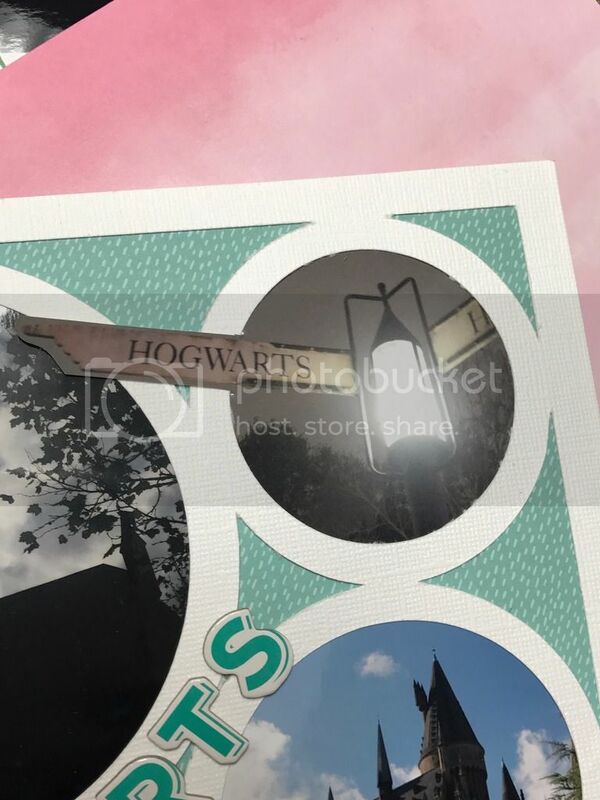 This card features a narrow mat under the patterned paper panel as opposed to the larger mat on the previous card. 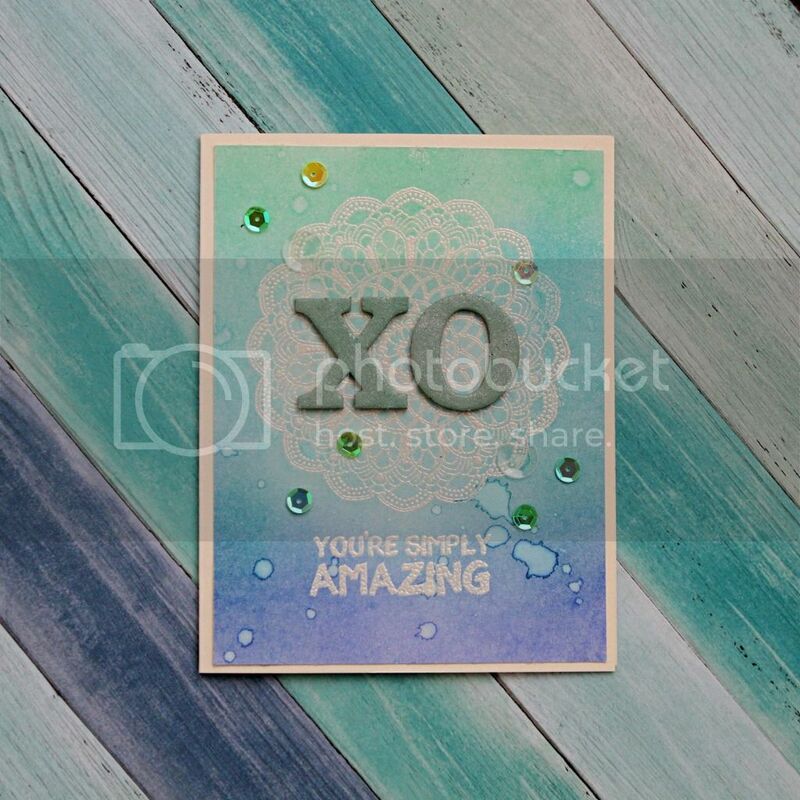 This card features a die cut panel holding the sticker sentiment which has been raised with pop dots. The chipboard snowflake has been painted with the Ranger Silver Metallic Paint Dabber and then placed over the centre of the ribbon bow. 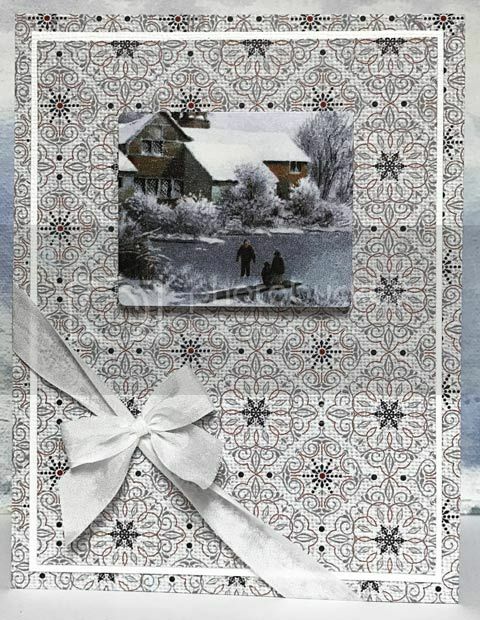 Lastly, we have this stunning card which demonstrates how easy it is to mix and match the patterned papers in this kit. 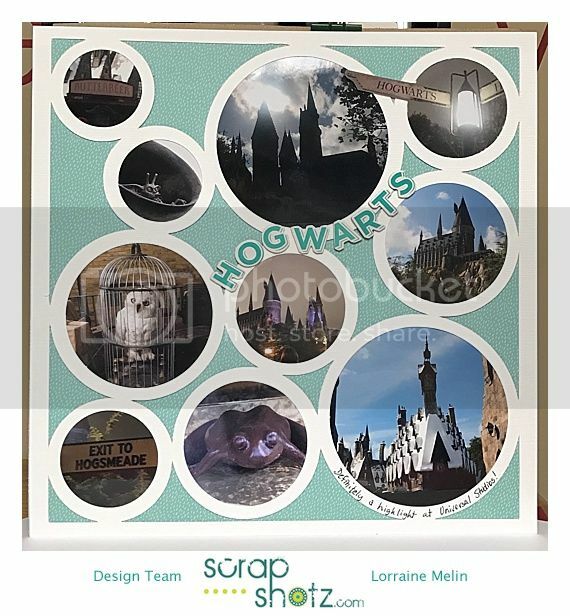 The sentiment quote, image and banner are all stickers from the 12x12 sticker sheet that was included in this kit. 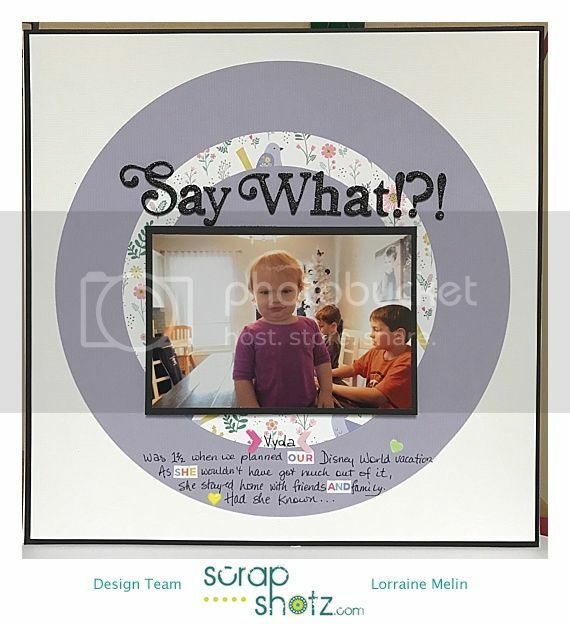 Come back in the next few days to get a look at Lorraine's scrapbook layouts created with this kit. Tim Holtz Oxide Inks are in the Store! You can order your very own set of the brand new Tim Holtz Oxide Inks right here, you can also purchase individual colours if you want to just give a few a try right here. Here is the one and only Tim Holtz explaining his new Oxide Inks product right here. Jennifer McGuire also has a great video introducing Oxide Inks Jennifer McGuire Oxide Inks. You can order the full set here or order individual colours if you'd like right here, just scroll until you reach the inks ;)). Have you been in the store lately? 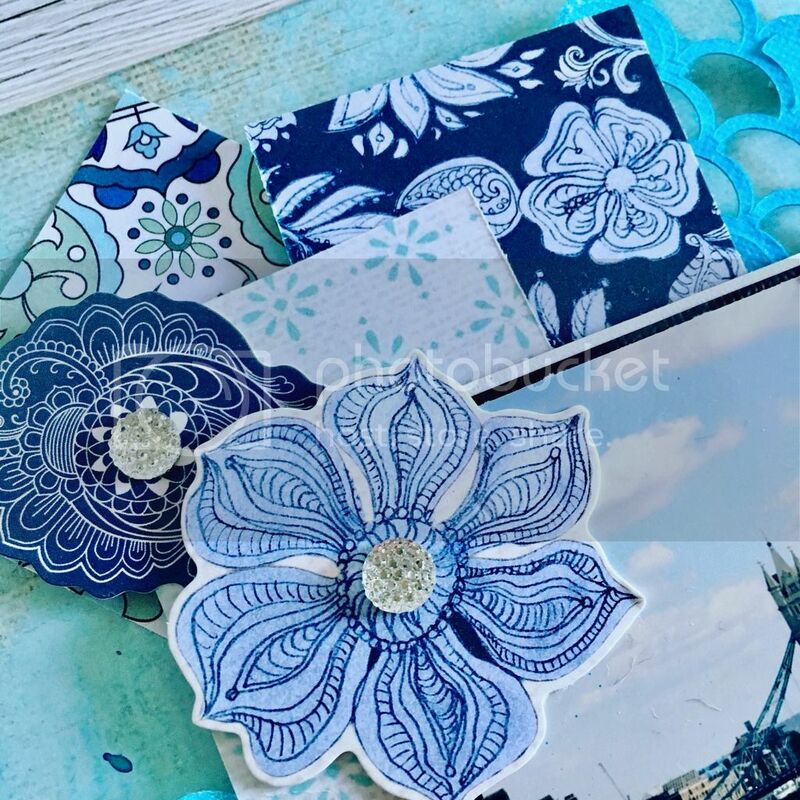 There are also new Thickers, Prima Art Alchemy paint, 2 new Kaisercraft lines, Tim Holtz stencils, Paper House flip albums, Mama Elephant stamps and more! There are also a few kits available for single purchase so check out the store! 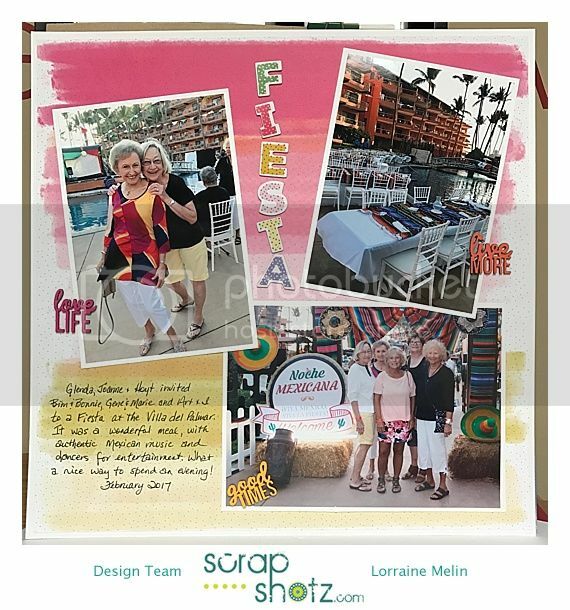 If you want to get your hands on any of the newest products unveiled at Creativation 2017 contact Sandy to place your special order. 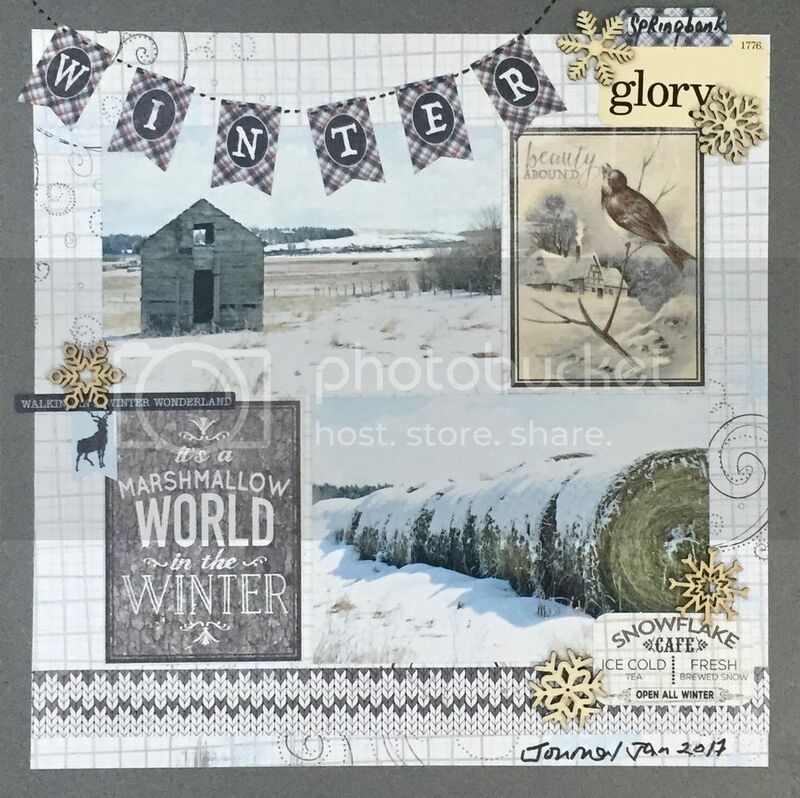 Welcome back for another round of January kit projects from the talented Virginia. 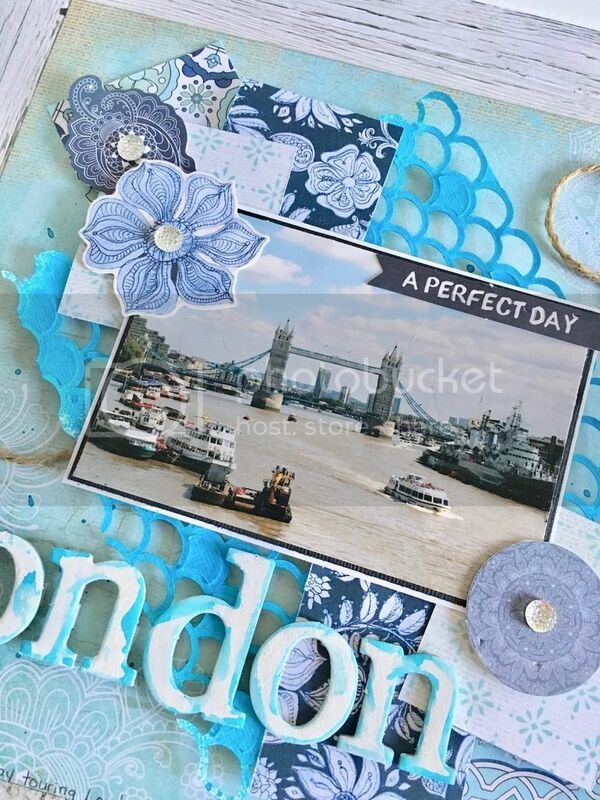 The beautiful doily was stamped and heat embossed with the stamp included in the kit. A scatter of sequins add the perfect amount of shine to this card. 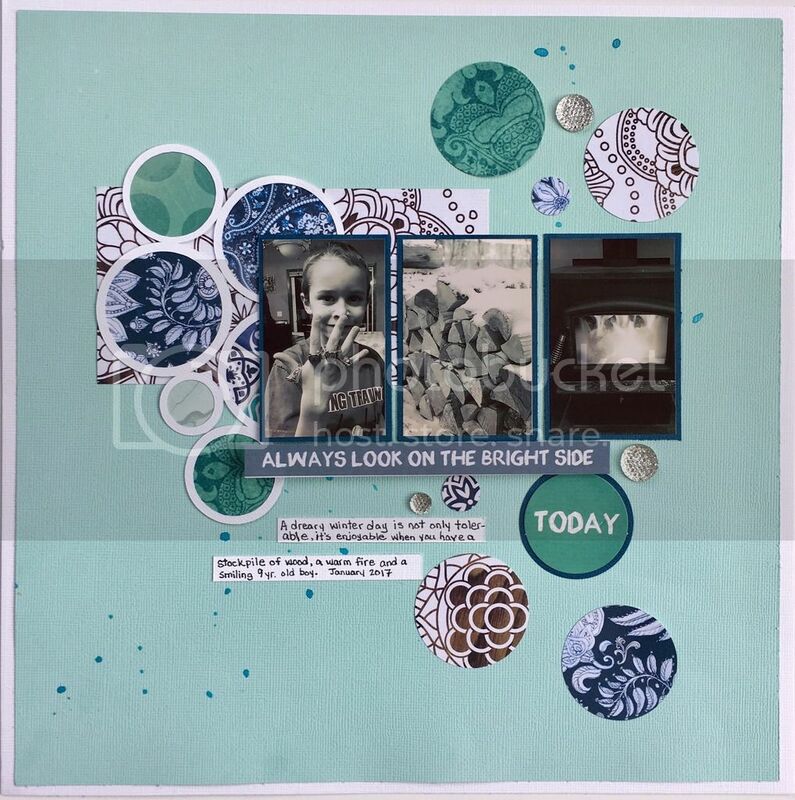 Virginia made great use of the kit stickers and die cuts on this layout. Love how she journaled with the stickers. 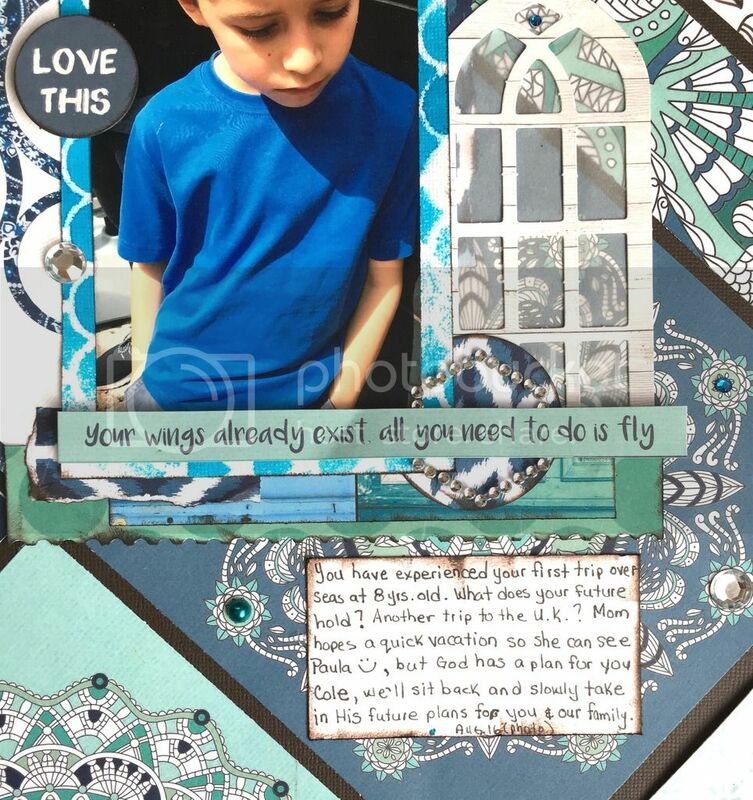 There are so many fabulous quote die cuts in this kit and this layout shows off a number of them. 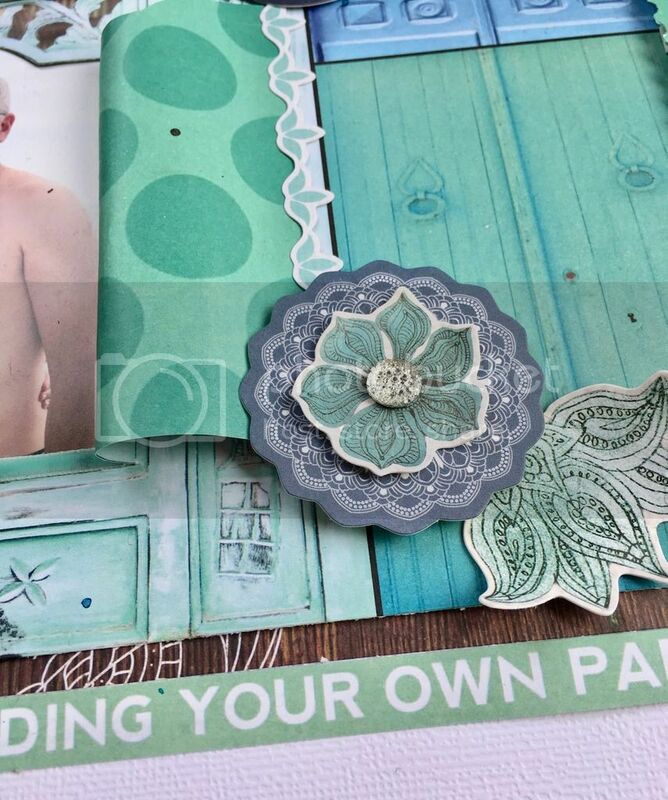 The blues and greens in this kit are such a lovely colour palette and work so well together as you can see on this project. 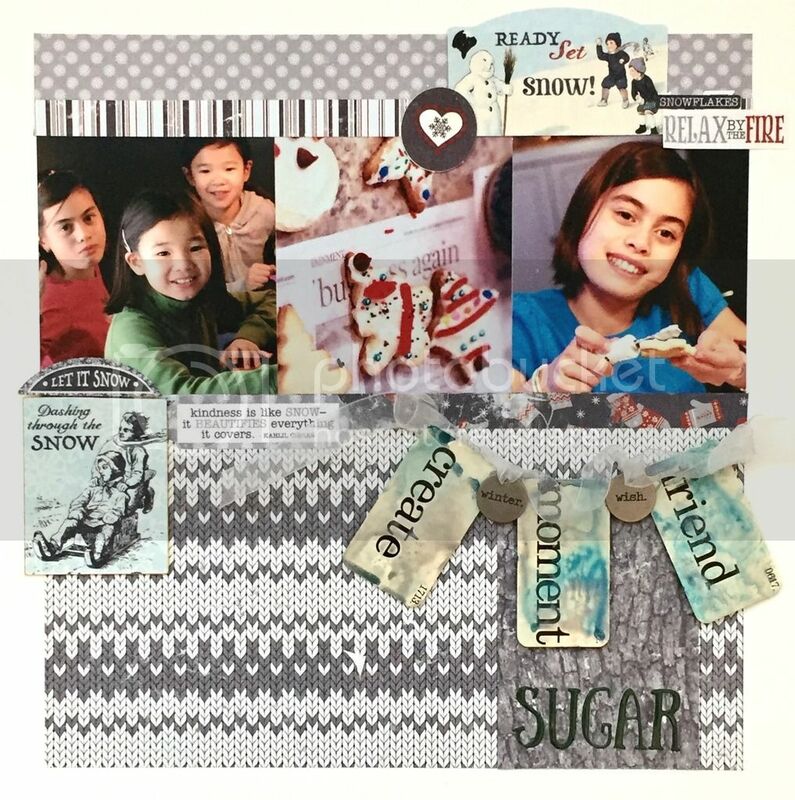 This stunning layout brings to a close the Scrap Shotz January kit projects. The fussy cutting was worth the effort as the cascade of flowers highlights this sweet photo beautifully. It's Rosie with my remaining projects created with the stunning Scrap Shotz January Kit, Sweet Dreams. There appear to be a few single kits remaining so hurry over and nab one for yourself if you're not a subscriber, just click here. 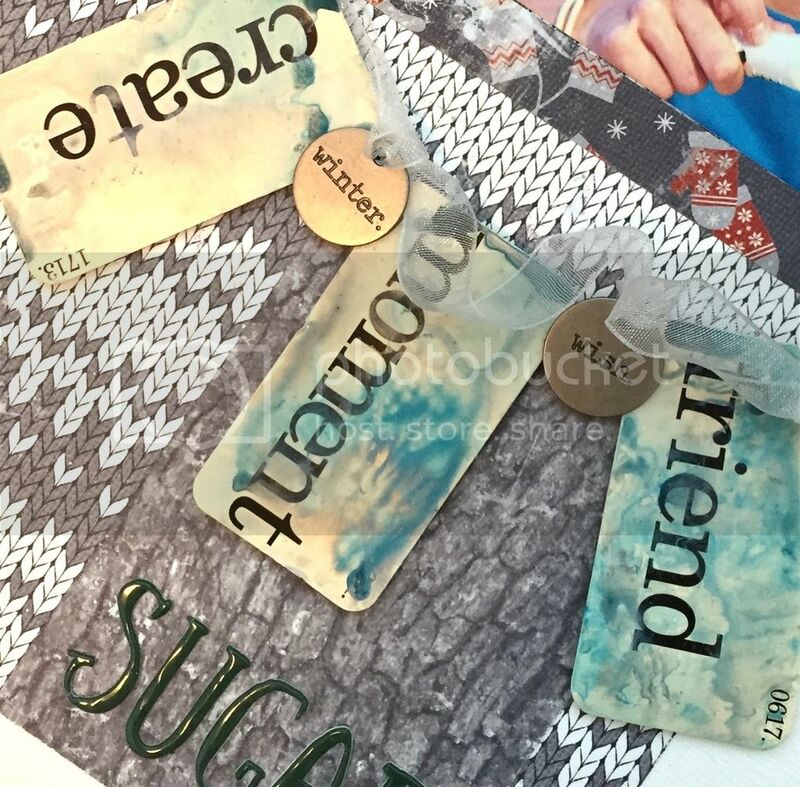 I purchased the mandala stencil add on, applied embossing paste, covered the paste with Emerald Creek Fractured Ice embossing powder and then heat set. 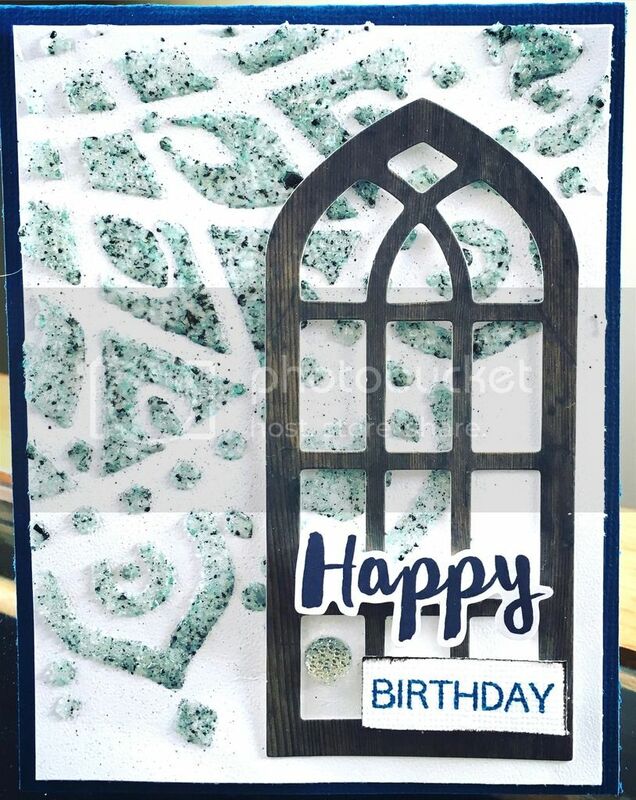 I popped up this kit die cut and sentiment with pop dots and a quick, simple yet stunning card was complete. I think this works really well as a masculine card. The birthday sentiment is from the Birthday Greetings stamp set by Altenew which is not currently in stock but you can order it directly from Sandy. I really liked this sketch and kept my interpretation fairly close to the original. I layered the die cuts and popped up a few of them along with one of the kit stickers. The "enamel" dots are created with Nuvo glitter and crystal drops. 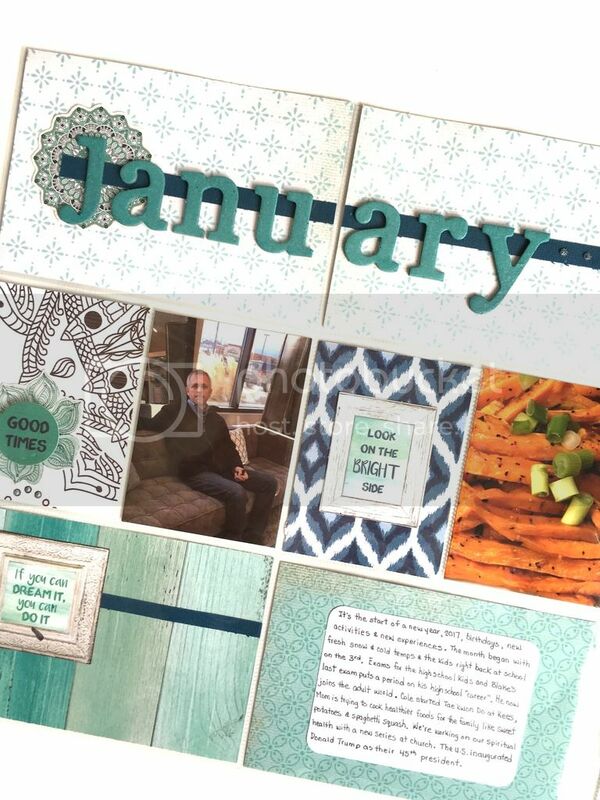 This month's 2 page layout is a Project Life spread documenting January of course ;). 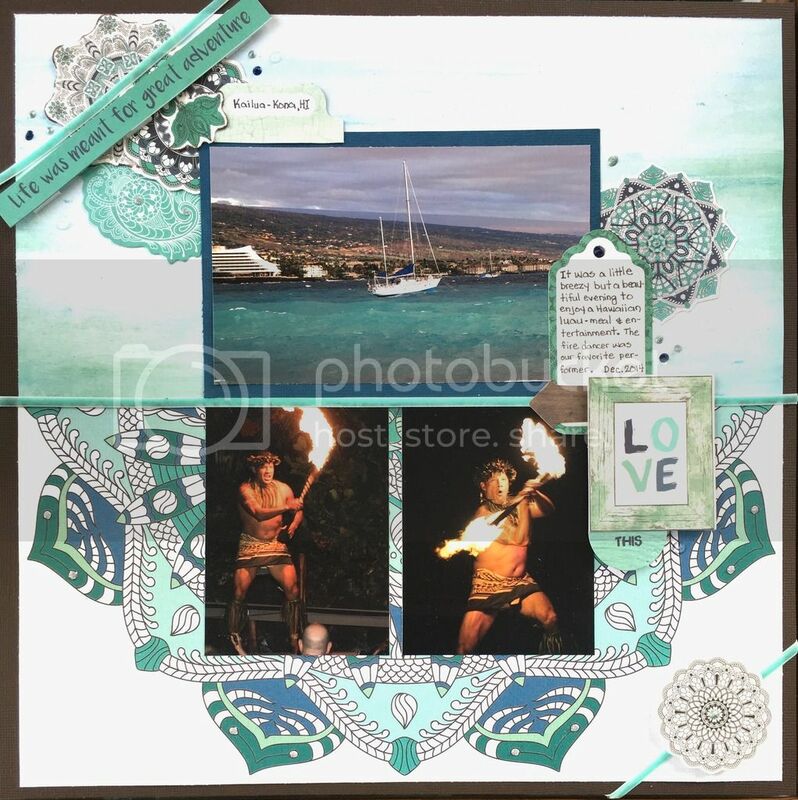 The 3x4 "Best Ever" card was stamped with the kit stamp and ink and then coloured in with the add on Kaiser Mists Turquoise mist. The chipboard letters are also sprayed with the mist and have a lovely silvery shimmer undertone that the camera doesn't pick up. Here's a closer look at the left hand side page followed by the right hand side. I pieced a patterned paper background over brown card stock with off cuts and the mandala paper. 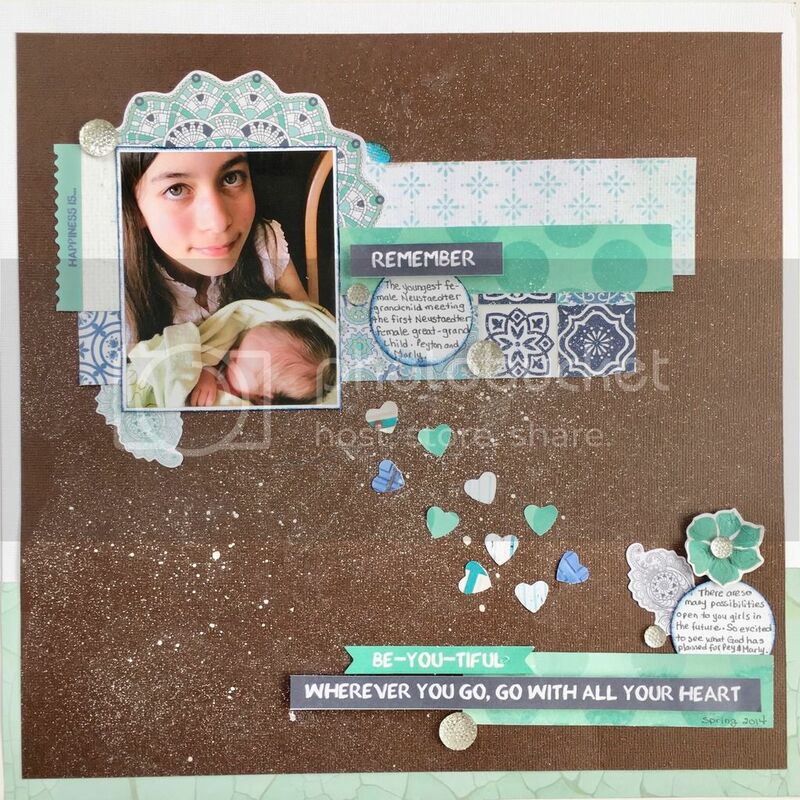 The photo mat is a piece of white card stock layered under my Cameo cut file and misted for this layout. 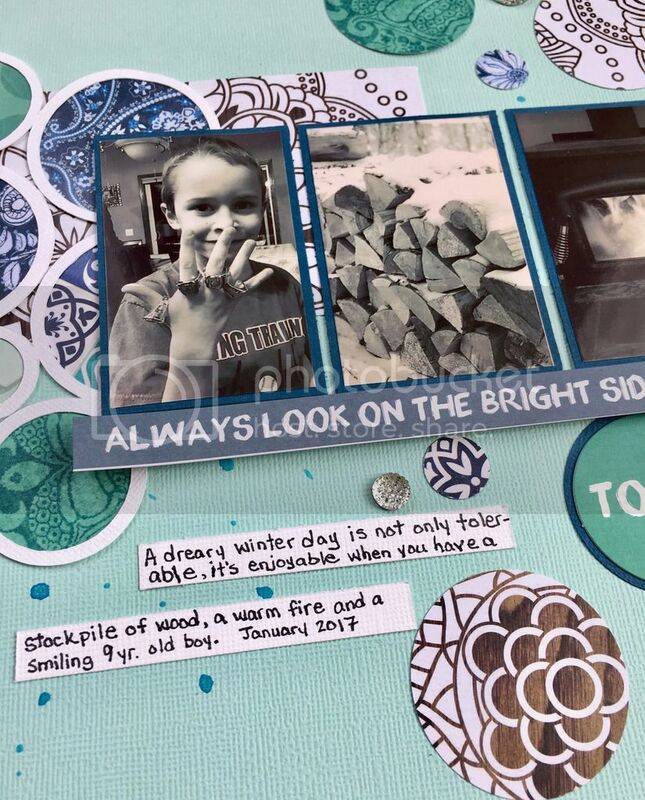 The window frame die cut is backed with vellum, journal block edges inked with the kit Bark ink and embellished with pearls and bling from my stash. Click here to get one for yourself if you are not already a kit subscriber! 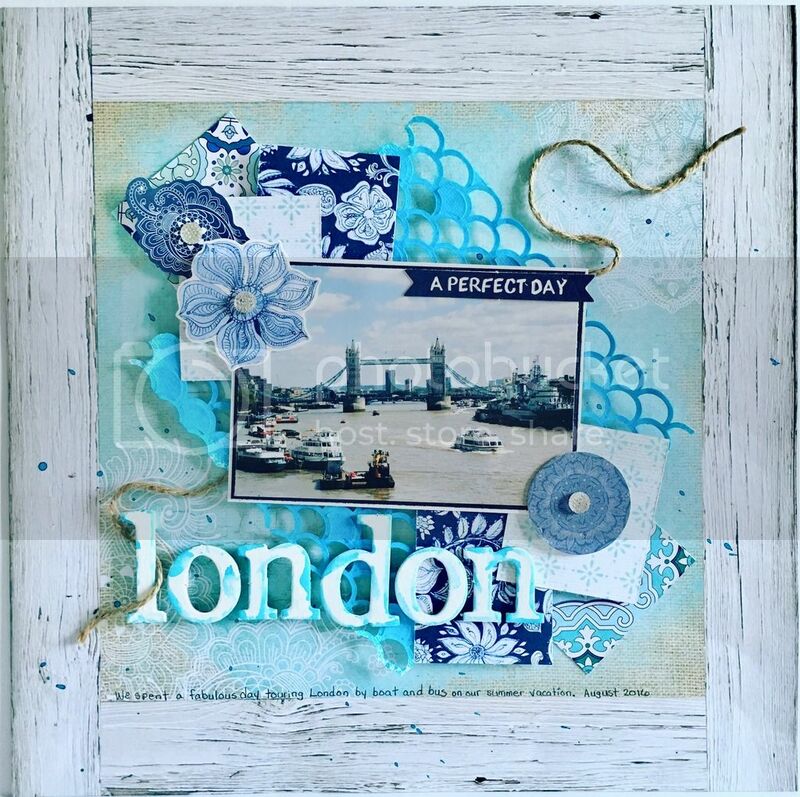 Rosie here to share with you my projects using the January kit featuring the stunning Ubud Dreams line by Kaisercraft. I also purchased the stencil add on and the Kaiser mist add on, both are sold out but there are a few kits available as a single kit purchase, just click here. Let's take a look at some layouts shall we? 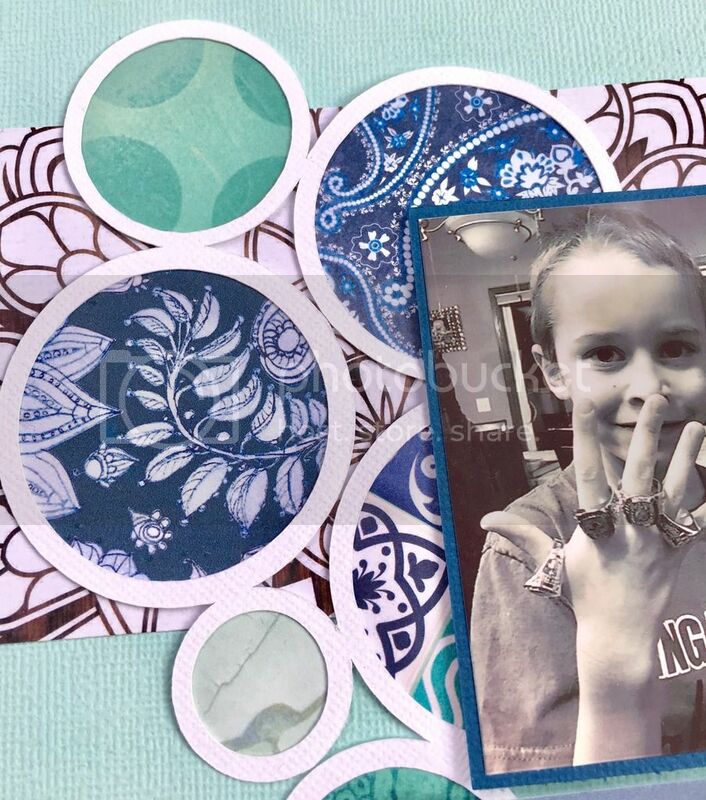 I am challenging myself to use my electronic cutting machine more so I created the circle mat and backed the openings with patterned paper. I flicked mist on the card stock prior to adhering the patterned paper. Photos were printed on my zero ink printer and matted on the Denim card stock. 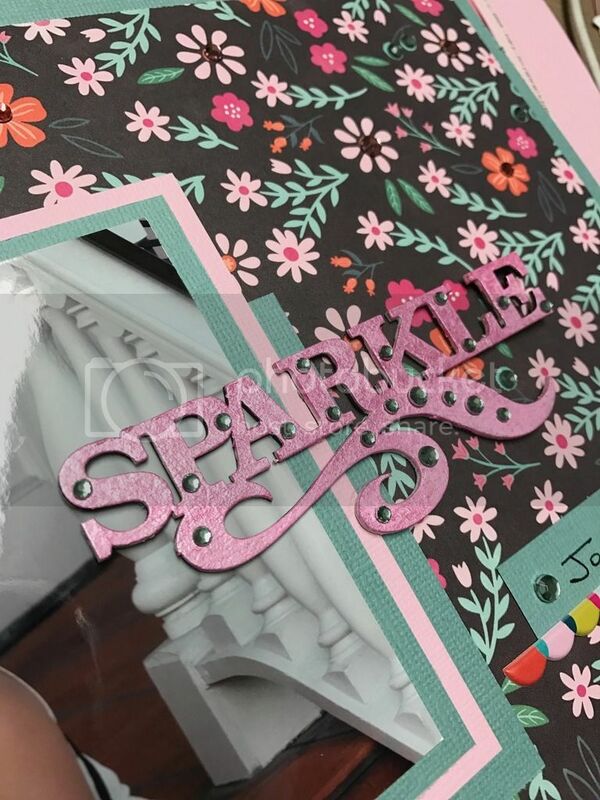 The Kaisercraft sparklers add the perfect amount of bling along with the sticker quote and 'today' die cut which are included in the kit. 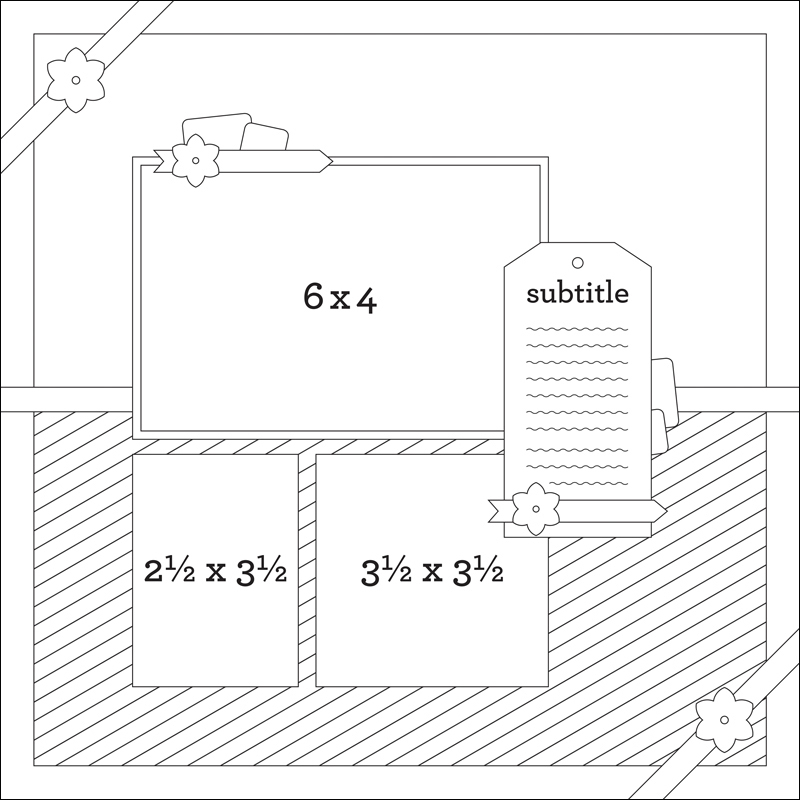 I put my Cameo to use again on this layout re-sizing a Silhouette 12x12 background file. I've left some of the negative pieces in place, misted with the Kaiser Mists and attached with pop dots. 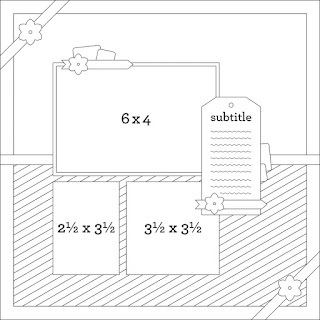 Paper squares are layered over each other under opposite corners of the photo. The chipboard alphas are painted with gesso and then edged with the Kaiser iridescent spray ink. I fussy cut this door patterned paper and folded back the "doors" as a frame for the photo. I've layered die cuts and curled up the edges of some to add interest. 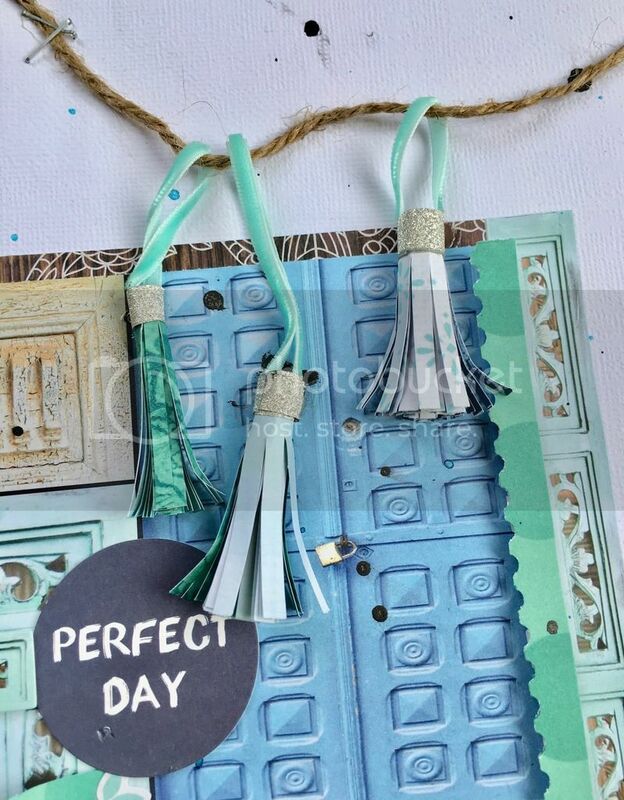 Handmade paper tassels hang from twine, the silver glitter tape is also from Kaisercraft. The die cut flag provides the perfect place for journaling. Paper scraps from the previous layouts provide the perfect base for the photo and sticker quotes. Once the paper scraps were adhered white mist was sprayed. 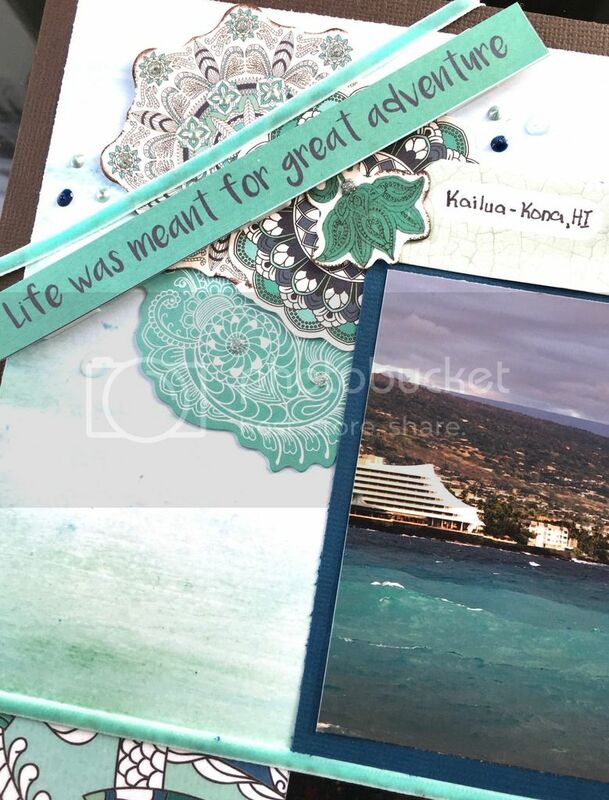 The journaling spots and photo mat are edged with navy ink. 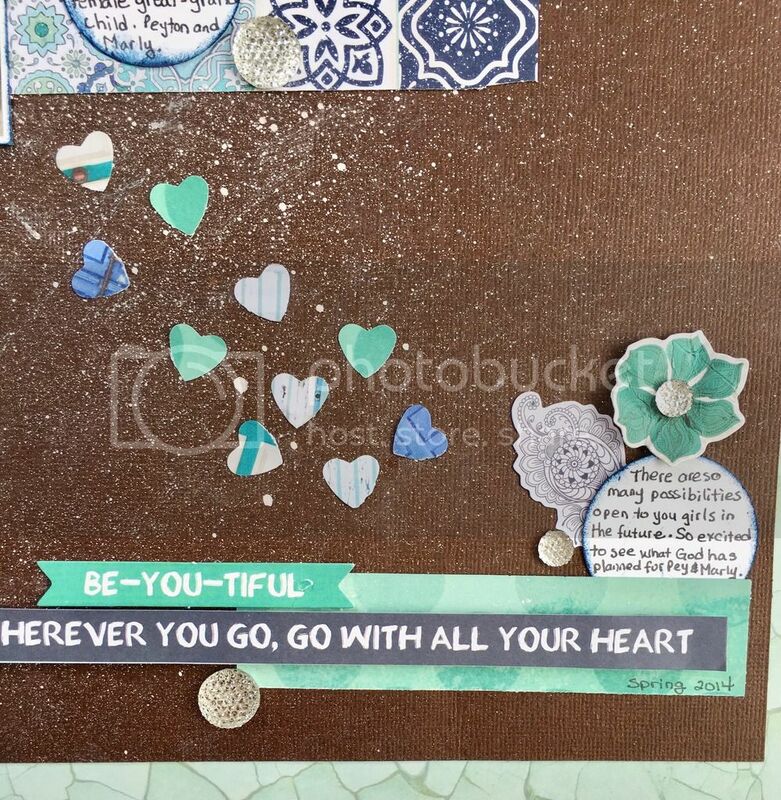 A scattering of punched hearts lead the eye from the photo to the sticker quotes and another journal spot. I hope you've enjoyed perusing these projects. This is just the beginning of the DT reveal, I'll have a couple more projects to share with you soon so keep checking back!